Dive walker is an unique 32 kg full clear shield helmet made from stainless steel. 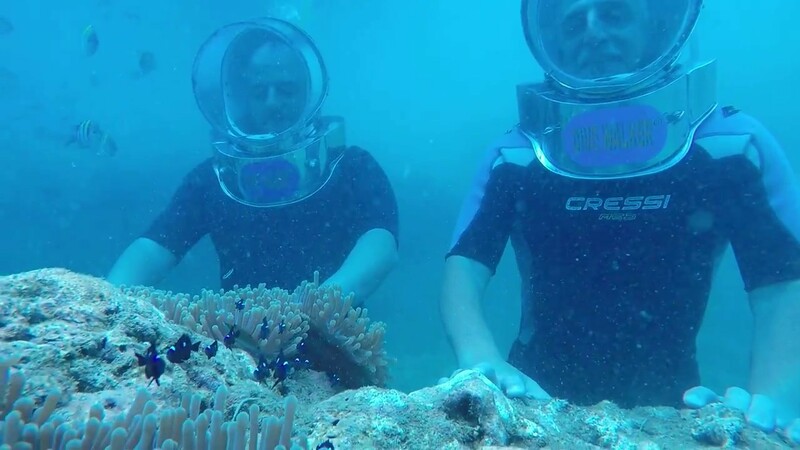 This helmet will help you to explore underwater to a depth of 7 to 8 meters, easily and safely. Children minimum age of 12 years old and adult up to 80 years (condition apply) is allowed to do dive walker. Before the activity, you have to fill in the safety information form and after that the dive instructor will brief you in detail, how to use hand signals, how to equalize your ear and also the safety procedure in case of emergency. You have to wear special wet suit & boots before doing the activity to protect you from biota disturbed like jelly fish, etc. 3.Change into your swimsuit and dive suit. 4.Storage locker with key available to keep your towel, clothes ,valuables, etc. 5. a dive walker safety lesson covering emergency procedures, clearing ears, hand signals etc. 7.Arrive at dive point! You can enjoy view of Nusa Dua Resort from the point. Dive point depth is approximately 6 to 7 m.
8.Dive using an oxygen equipment! And then down to the bottom of the sea. 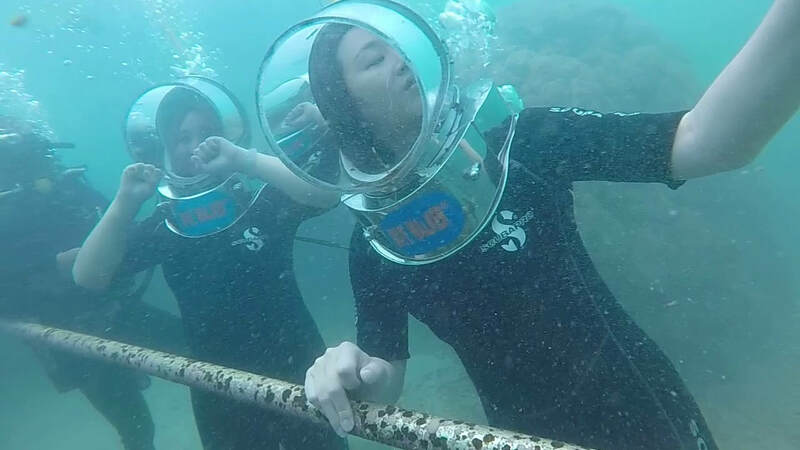 9.A trained dive walker instructor will accompany you during the dive. 10.Down the stairs to the bottom of the sea. You can enjoy beautiful marine life including beautiful fish, colorful corals for about 30 minutes. 11.Back to the beach by a small boat. 12.Take a shower and change clothes. You need to bring a towel. Is it possible to dive wear glasses or contact lenses? Yes. With helmet diving system you will only get wet at the part of chin. The wearer of the helmet does not have water enter the helmet. You can wear your glass or contact lenses. Will someone be with me? Yes. 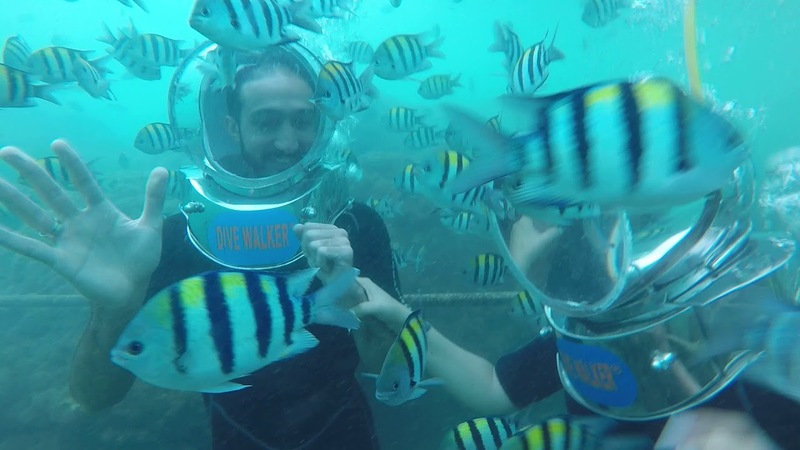 You will be accompanied by a trained dive walker instructor during activity. Is Dive walker helmet heavy? 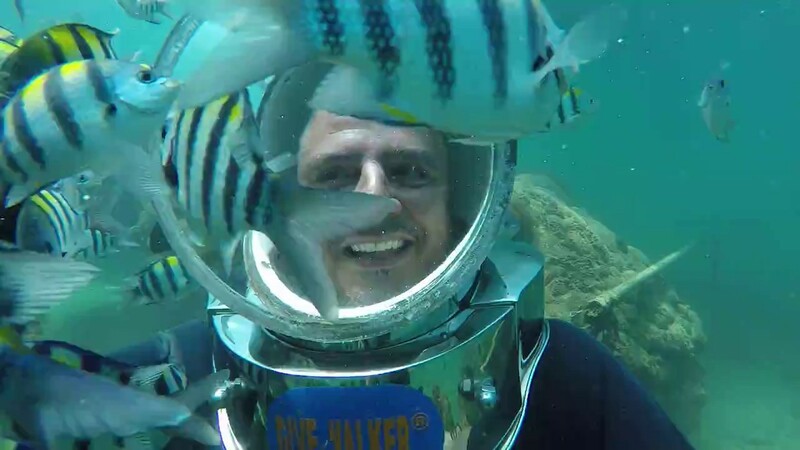 Dive walker helmets weight only 7kg underwater. Is it possible to use personal camera? Yes. You can use your own underwater camera, but make sure your underwater camera should be good at depth up to 8metres. Losses not included in insurance. Available underwater camera rental Rp.300.000 with CD burner included. People of all age can join this activity? Age Limit: 10 years old to 81 years old. Guest with hypertension, heart or lung problems, pregnant, respiratory ailments, on medication etc cannot dive. How do I have a meal? Prices do not include meals but you can order a meal. There are English & Japanese-speaking staffs? Only chief guide staff can speak Japanese and English fluently.